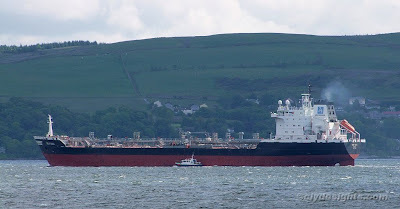 Although she had embarked a pilot at Little Cumbrae, the tanker GREAT SWAN was seen at the mouth of Loch Long with the cutter TOWARD alongside as she was making her way to Finnart on Saturday morning. GREAT SWAN is operated by Brostrom Tankers, although she is owned by a Danish company, Uni-Tankers. She was built at Kiel in 1991 by the Lindenau Shipyard and is 169.93 metres in length. She has a deadweight of 23,480 tonnes, and carries Danish senior officers and Filipino crew. She was arriving from Milford Haven to load a cargo of products for Ghent.